Asian food makes me happy. I like making it because it allows for a lot of flexibility and the flavor combinations are fantastic. I'm particularly a fan of spicy heat combined with sweetness that can be found in any number of popular Asian dishes. It's almost as though the sweetness tames the heat, but not too much. So when I start wanting lighter dishes that rely more heavily on vegetables, I start looking at Asian cuisine more. For me, wrapping a fun filling in a spring roll wrapper is a great way to do just that. You could also serve the filling in lettuce, but the spring roll wrappers tend to be less messy when you roll them properly. I like simply rolling the filling in a softened wrapper and serving them with my own dipping sauce, rather than baking or frying the rolls at all. In a small nonstick skillet, heat the chili oil over medium-high heat. Add the chicken and brown on both sides until a light brown crust forms. Add the butter and hot sauce, reduce the heat to low, and cook for an additional 4 minutes or until the chicken is fully cooked. Slice the chicken into small pieces and return to the pan and coat evenly with the sauce. To assemble the spring rolls, place a shallow pan of hot water on an even surface. Carefully float a single spring roll wrapper in the water, making sure it is fully submerged. 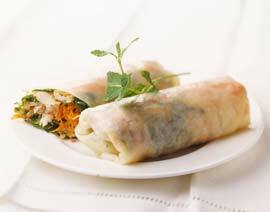 Once the wrapper has softened, remove it to a clean plate and place one tablespoon of the chicken filling in the center, add enough veggies and sesame seeds (you can also use a little sticky rice, if desired) to make about 3 tablespoons of filling for each roll, and carefully tuck both ends in and roll it into a tube. Repeat this process until the filling has been entirely used. Serve the spring rolls with a dipping sauce of your choice. To make things a bit less messy, I will spoon about 1 teaspoon of the sauce into the spring roll and serve it as such. The dipping sauce recipe included here is great with chicken, seafood and pork. Any rolls, fried or not, as well as other dishes suitable for dipping could take advantage of it. That said, it's really fantastic when paired with the simple spring rolls above. In a small saucepan, heat the mirin over medium-high heat. When it begins to simmer, add the vinegar and corn syrup. Cook for 2 minutes more before adding the remaining ingredients and stirring to combine. Remove from the heat and carefully pour into two clean pint jars. Refrigerate until ready to use. * Mirin is sweetened rice wine often used in Asian cooking. It can be found at Asian grocery stores or in the ethnic section of larger grocery stores. If you need a substitute, consider adding a bit of corn syrup to a dry white wine.